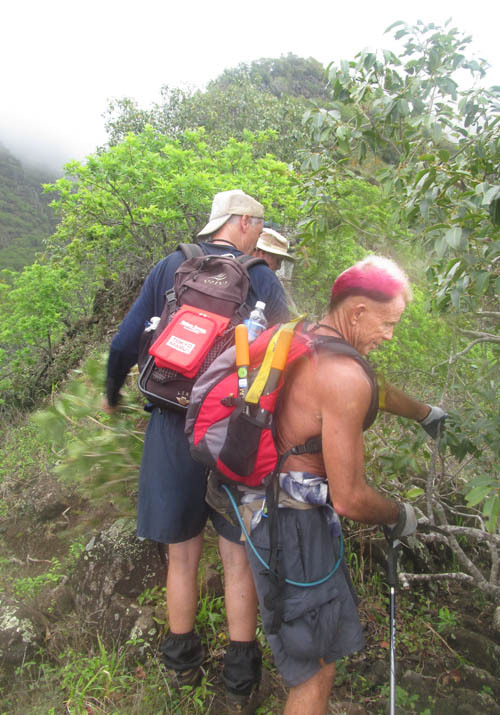 I joined the trail maintenance crew of the Hawaiian Trail and Mountain Club (HTMC) to clear the middle ridge of Ohikilolo Valley that leads to the summit of Keaʻau Ridge on the Waiʻanae Coast of Oʻahu. After rendezvousing at Makaha Beach Park, we drove to Ohikilolo Valley where the locked gate was opened for us to drive through. We then parked at the entrance of a retreat owned by the Franciscan Order of the Catholic Church which runs Our Lady of Keaʻau — a mission that ministers to the needs of the homeless on the Waiʻanae Coast. 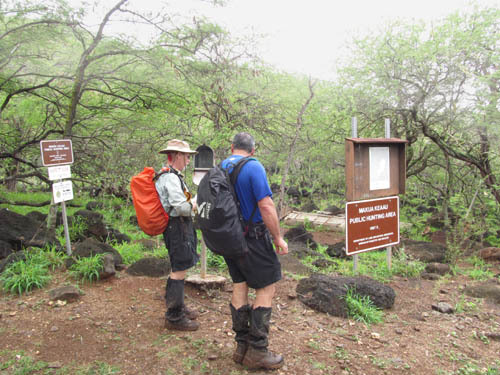 Despite the weather forecast which called for thunderstorms, the trail clearing group was undaunted and made its way up the dirt road, crossed the dry stream bed, and signed-in at the hiker-hunter check-in station. 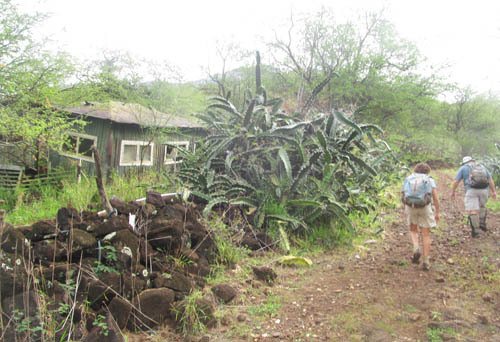 Decades ago, ranching was the primary economic activity in Ohikilolo Valley and we past a number abandoned structures as we made our way up the dirt road. 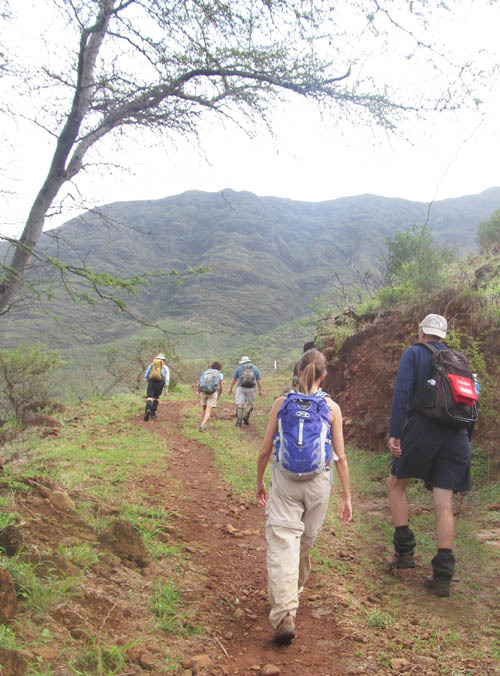 Ohikilolo Valley is located on the dry leeward side of Oʻahu between the much larger valleys of Makaha and Makua. The valley is usually so parched that hikers kick-up dirt clouds with each step. But since it rained the night before, the moisture held the fine dirt down as we made our way into the valley. 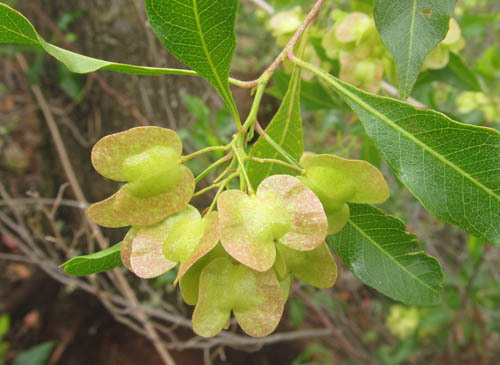 Ohikilolo is known for its ʻaʻalii (Dodonaea viscosa) which grows into a small trees 6-12 feet high. 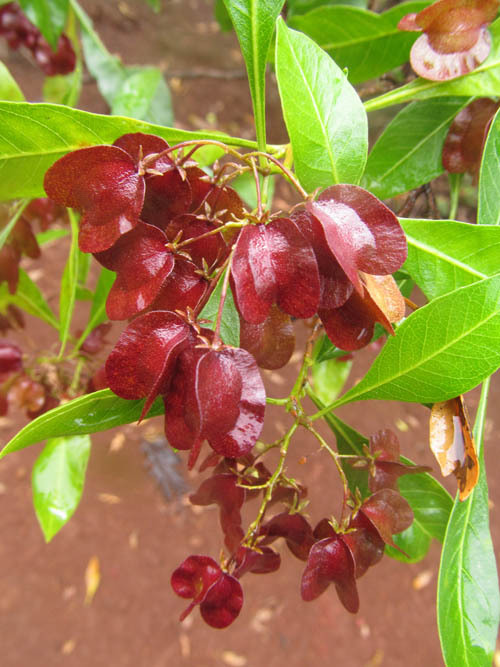 With the recent rainfall over the past few weeks the ʻaʻalii were full of seed capsules — the most common color being red. 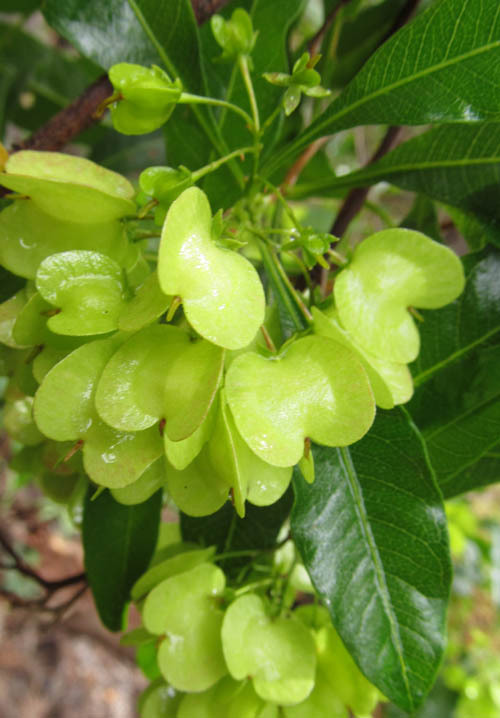 But ʻaʻalii seed capsules come in a variety of colors. I was pleased to see yellow-green capsules as we made our way up the dirt road. Red and green often mix together to create shades of pink. I could not resist stopping at the each ʻaʻalii grove along the way to examine their seed capsules. 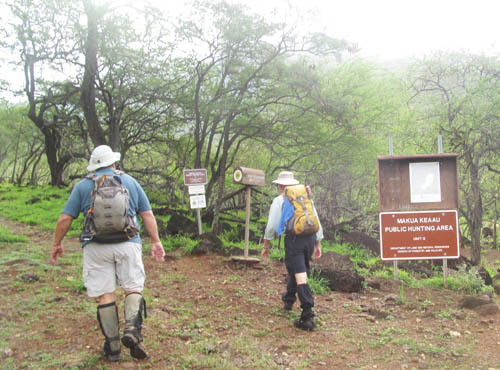 After passing a defunct water tank on wheels, we crossed another dry stream bed and started a slow ascent up the middle ridge in Ohikilolo Valley which leads to the summit of Keaʻau Ridge. With cattle and other animals making multiple trails in the area, it was difficult to find our way and we back-tracked several times. So we marked the way with ribbons as we hacked our way up the middle ridge. 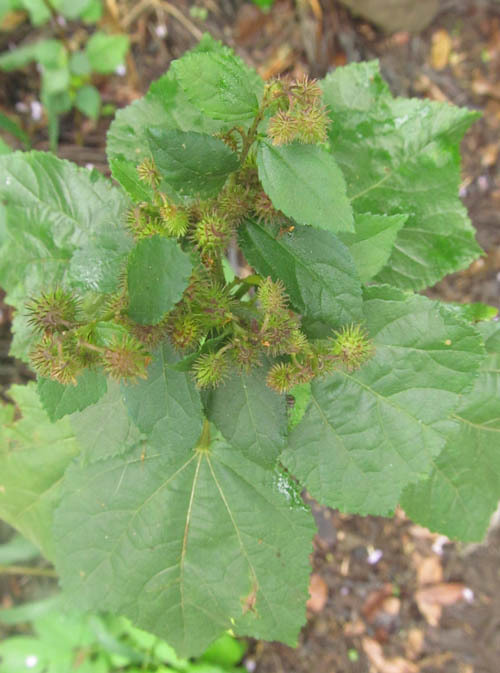 One of the more disturbing invasive plants I saw on the trail was Triumfetta rhomboidea which produces burrs that hitch a ride on your clothing and footwear. I stopped several times to pick burrs off myself to avoid carrying them to the summit of Keaʻau where some exceedingly rare and endangered native plants can still be found. While making our way up the middle ridge, we watched a bank of clouds drift in and settle in the valley. It became so humid that the air felt thick and oppressive. We were treated to the rare sight of Laredo Muredo, his hair dyed pink for Valentine’s Day (I’m a little behind posting my hikes), carrying a backpack! Laredo sips water like a camel and usually only carries a small fanny pack. Come to find out someone used her feminine charms to get Laredo to carry her pack. The middle ridge parallels close to Ohikilolo Ridge and offers a close-up view of its fluted cliffs. It was amazing to see clouds shrouding the mountain tops — an uncommon sight on the dry side of the island — which made Ohikilolo Ridge look almost like the Koʻolau Mountains from the windward-side. 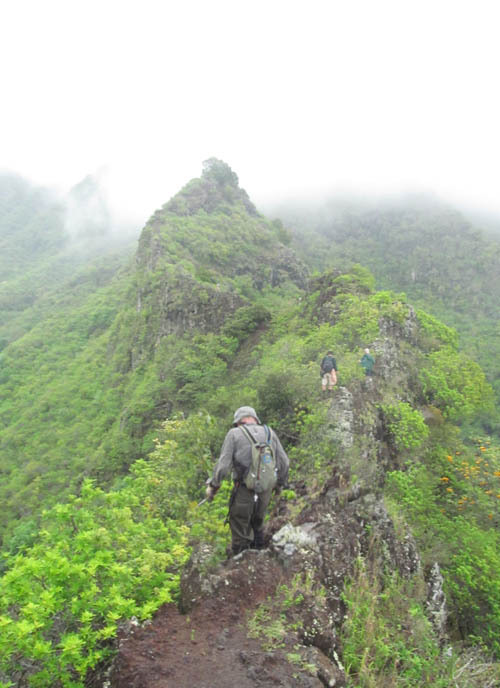 With little breeze to cool us off and the air becoming increasingly humid, our clothes were soaked with perspiration as we climbed from one puʻu (hill) to the next. And then it happened… BOOM! Rain pummeled us from the skies! The rain drops were so large that they actually stung when they pelted us! 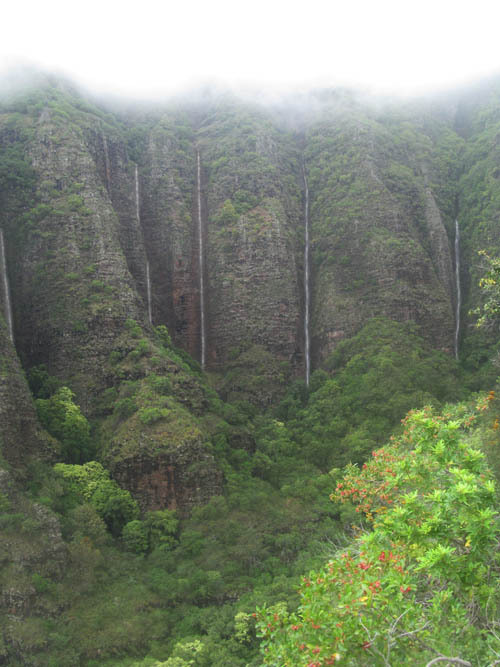 With so much rainfall, each fold on Ohikilolo Ridge became a waterfall! And then we heard several loud CRACKS! Boulders dislodged by the rushing water hit the rocks below with such force that they almost sounded like gun shots! 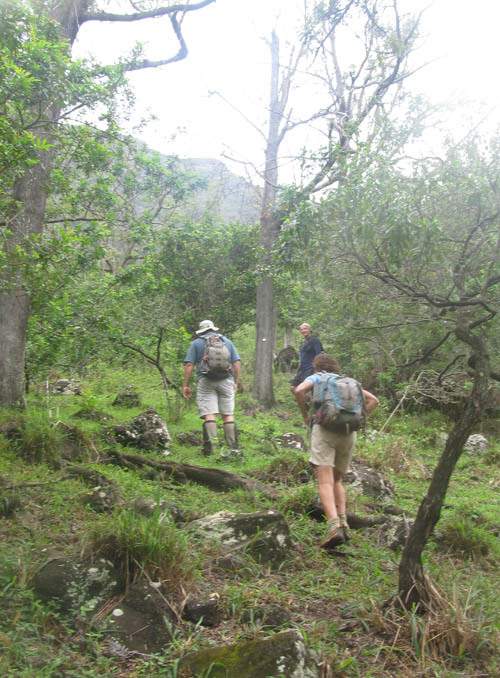 With so much rainfall and dislodged rocks, a decision was made to call off the hike. 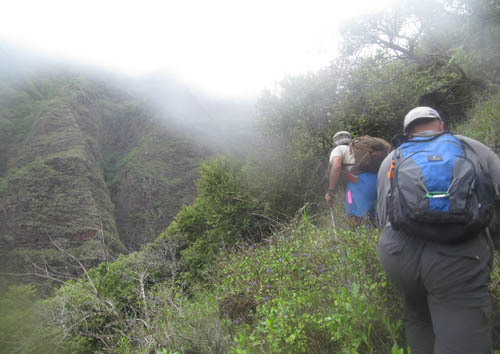 So we turned around about half-way up the 2,900 foot summit of Keaʻau Ridge. While descending the middle ridge, a lull in the rain allowed me to get a clear shot of the ephemeral waterfalls in each fold of the ridge. We could see more dark ominous clouds moving in from the west, so we were not fooled that the weather would improve and continued to retreat down the middle ridge. The dirt on the lower sections of the ridge turned to mud and we slipped and slided precariously down to the bottom. After checking-out at the hiker-hunter check-in station, we crossed the dry stream bed at the front of the valley. Despite all the rain in the days leading up to our hike, the wet season has been relatively dry this year and the parched landscape was able to soak up all the rain that fell. Although I was disappointed I was unable to visit the rare plants at the top of the ridge, it was wise not to go to the summit. Not long after we reached our cars heavy rains fell again and lightening flashed across the skies. As I drove back home, I reflected on the great time we had seeing so many colorful ʻaʻalii seed capsules and the ephemeral waterfalls that spontaneously formed on the ridge before our very eyes. What an awesome sight! holy christ! the pic of those waterfall chutes are awesome! how rare is that?! awesome nate! Yep… an exceedlingly uncommon sight on Ohikilolo Ridge. Thanks! Presumably the second “k” in the title is a typo? Worth fixing?